This Dodge Viper packs 640HP and 600 lb-ft of torque power. However, the Viper is not a vehicle one could just carelessly fool around in. Nevertheless, it looks like this Viper owner did not get the memo. In the video below, you can see a massive Dodge Viper crash which looks very heartbreaking. This immense crash happened at the Cars and Coffee event in Houston, Texas. What you are about to see is a very old and predictable tale which happened many times over the past. When this Dodge owner was leaving the car event, he saw a huge crowd at the exit. Upon seeing this huge crowd, his adrenaline pumped up and he decided to try and make a spectacle by going fast. However, sometimes it doesn`t work as you`d liked and the car will spin around and meet the curb. This is when all the onlookers get their phones out and start recording. That said it`s not Cars and Coffee if there is not an incident that will produce a viral video. Anyway, we can safely say that this Dodge Viper owner didn`t have a particularly good day. The legendary Viper was just discontinued at the beginning of this year. It boasted a staggering 208mph top speed and is powered by a huge, stonking 8.4L V10 engine. The Viper will be remembered as a magnificent old-school hero which died in a world full of dual clutches, turbocharges, and all-wheel drive. 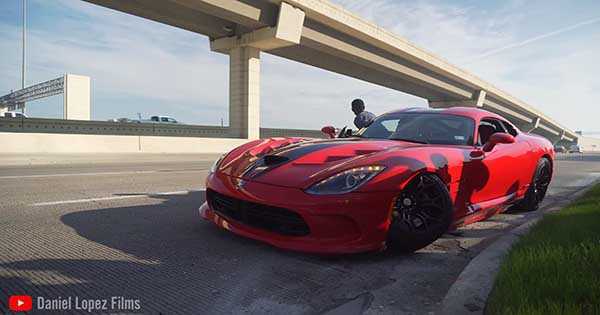 To see the massive Dodge Viper crash, check out the video below. At last, check out this Pagani Zonda wrecked!